The sawfish derives its name from its elongated, blade-like snout, that is studded with “teeth”. While they look similar to sharks, they are actually highly derived rays. The smalltooth sawfish is one of five species of sawfishes found worldwide. 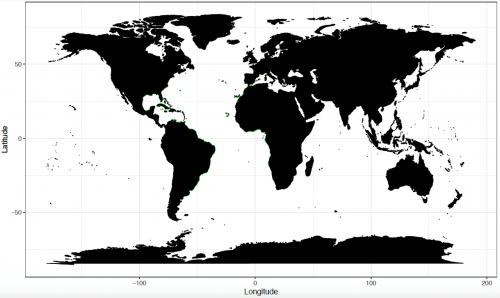 Historically, the species had a wide distribution ranging across tropical, subtropical, and estuarine waters throughout the western and eastern Atlantic Ocean. Today, however, the smalltooth sawfish has been extirpated from most of its former range. It is now only reliably found in the southeastern United States and Bahamas (Carlson et al. 2013). Fun Fact: The smalltooth sawfish can grow to be 18 feet in length, with about 21-30% of the total size being the length of their rostrum (Faria et al. 2012). The smalltooth sawfish is protected under Appendix I of the Convention of International Trade of Endangered Species (CITES). International trade in sawfishes is illegal, however trafficking still goes on in some parts of the world. Sawfishes are valued not only as a food fish, but also for their liver oil that is used in medicines, soaps, and in leather tanning products. Their large and fibrous fins are highly valued for shark fin soup. 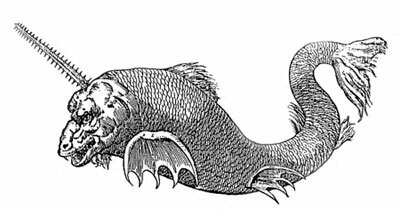 The rostra are often sold as curios and adult fishes stuffed for display (Carlson et al. 2013). The smalltooth sawfish is also considered a prized gamefish, mainly due to its fight on the line (International Sawfish Encounter Database 2018). Humans are not in any direct danger from the sawfish. However, the saw is extremely dangerous and can cause serious injury if an animal is surprised, frightened, or captured. Habitat destruction and overfishing have caused the extirpation of the smalltooth sawfish from most of its former range which extended across both the eastern and western coasts of the Atlantic Ocean. It currently survives in a few remnant pockets of its former widespread range. Smalltooth sawfishes are currently known to occur in the United States, Bahamas, Cuba, Honduras, Sierra Leone and Belize. Several subpopulations are now believed to be extinct, including those on the West coast of Africa and in the Virgin Islands. The few remaining populations are small, fragmented and generally isolated from one another (Carlson et al. 2013). Sawfish have been protected in Florida waters since 1992, when a state ban on both commercial and recreational fishing was first implemented. On April 1, 2003 the U.S. National Marine Fisheries Service placed the smalltooth sawfish on the Endangered Species List, making it the first marine fish species to receive protection under the Endangered Species Act. The International Union for the Conservation of Nature and Natural Resources (IUCN) listed P. pectinata as “Critically Endangered” across its range in 2006. Currently, all species of sawfish are listed under Appendix I of CITES, which bans their involvement in any international trade (Carlson et al. 2013). For more information on sawfish conservation, please visit our Sawfish Conservation page. > Check the status of the smalltooth sawfish at the IUCN website. Smalltooth sawfish are found in the tropical and subtropical Atlantic Ocean. In the western Atlantic they have historically ranged from New York to Brazil, including the Gulf of Mexico and Caribbean Sea. In the eastern Atlantic they ranged from Gibraltar to the southwest coast of Africa, and likely also inhabited the Mediterranean Sea. However, the species is now only reliably encountered in the United States down to the Bahamas in areas where habitat is suitable (Carlson et al. 2013). Genetic research conducted by Faria (2013) challenged the previously held belief that smalltooth sawfish were a circumglobal species. He used genetic data to show that the species has only ever occurred in the Atlantic Ocean. The records of smalltooth sawfishes that had purportedly been recorded in the Indian and Pacific Ocean were shown to be cases of mistaken identity. Genetic data showed these records to belong to saws from dwarf and green sawfishes misidentified as smalltooth sawfish. Key habitats for juvenile smalltooth sawfish include shallow estuarine waters and mangrove shorelines. The subadult and adult sawfish transition to deeper and more saline waters, including mud banks, seagrass and sand flats, as well coral reefs (Sawfish Conservation Society 2018; Snyder and Burgess 2016). The sawfish is easily recognized by its flattened body and wing-like pectoral fins. The mouth and gill slits are located ventrally, as they are in all rays, the eyes are positioned dorsally.The rostral saw of the smalltooth sawfish comprises approximately 21-30% of the body’s total length (Faria et al. 2013). The saw is widest at the base, with teeth more broader than long, and evenly spaced apart. Rostral tooth counts vary regionally, from 20 to 32 on each side. Each tooth is slightly flattened dorso-ventrally creating a sharp anterior edge, while the posterior portion of the tooth has a groove that creates two cutting edges. The tips of the teeth are sharp, becoming blunt over time (Sawfish Conservation Society 2018). The smalltooth sawfish shares the western Atlantic and parts of the eastern Atlantic with the largetooth sawfish (P. pristis), and can be distinguished from it based on a several morphological characteristics. The first dorsal fin of P. pectinata originates at the same place dorsally as the pelvic fins do ventrally, while in P. pristis the first dorsal originates anterior to the pelvic fins. In addition, the pectoral fins of P. pectinata are smaller than those of P. pristis. The upper and lower lobes of P. pectinata‘s caudal fins are less prominent than those of P. pristis. Finally, the saw of P. pectinata contains 20 to 30 rostral teeth on each side of the rostrum while P. pristis has a maximum of 24 teeth on each side which are larger in size (Sawfish Conservation Society 2018). Smalltooth sawfish can be easily distinguished from other sawfish by its size and rostral teeth count and orientation (See table) (Last et al., 2016). Tan-brown dorsally with a white underside. There are no other distinct color markings on smalltooth sawfish. The rostral teeth of a sawfish are actually specialized denticles, which are a type of scale. Rostral teeth will not grow back if lost; however, teeth that are chipped will continue to grow as long as the base remains intact (Slaughter and Springer 1968). In addition to their rostral teeth, sawfish have 10 to 12 rows of teeth in their jaws, located ventrally on the body. The upper and lower jaws have approximately 88-128 and 84-176 teeth. These teeth are small and rounded, similar to other species of rays. Sawfish have dermal denticles that vary in size and shape. Dorsally, the denticles are blunt and ovate in shape with low pedicels, which give a roughness to the skin. The smallest denticles tend to be found toward the outer margins of the fins and on the head, just anterior to the eyes. Ventrally, the denticles are blunt, varying from round to oval to rounded sub-polygonal, and lack pedicels. The fact that they lack pedicels makes the ventral side smoother to the touch than the dorsal side. Denticles are so prolific ventrally that the skin is barely visible. The saws of newborns are completely devoid of denticles; however, by the time the animal reaches 4.5 feet (1.4 m), the saw is completely covered in denticles. Denticles on the midzone of the saw are similar in size to those located ventrally, but become larger toward the saw edges. 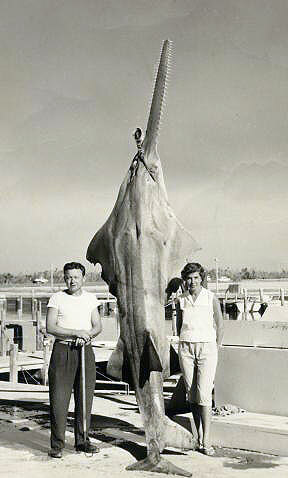 The maximum length for a smalltooth sawfish is 18ft (5.5m) including the saw (Bigelow and Schroeder 1953), however, historic reports suggest maximum lengths of 25ft (7.6m). The average lifespan is unknown (30 – 60 years according to EOL). The unique rostra of sawfish allow them to search for and capture prey. Their rostrum is covered with sensory “ampullae of Lorenzini” which detect electrical signals emitted from prey. Once detected, the sawfish swings its saw from side to side, impaling prey fishes on the rostral teeth. The sawfish then scrapes the captured prey off against the bottom substrate and consumes them. The saw is also used to disturb muddy bottoms in search of small prey items, including benthic invertebrates such as crustaceans. Sawfishes are ovoviviparous, producing embryos that mature internally and are nourished by a yolk sac. Fertilization is internal and results in about 15-20 embryos (Bigelow and Schroeder 1953). The gestation period is not known. In Florida, increased catch records of gravid females and juveniles in late spring and early autumn suggests that smalltooth sawfish give birth between November and July, with the peak period occurring between April and May (Poulakis et al. 2011). The saws of the pups are fully developed and sheathed upon birth in order to prevent injury to the mother when passing through the cloaca. Small size classes of the smalltooth sawfish are susceptible to predation by sharks. The smalltooth sawfish was first described by Latham (1794) as Pristis pectinatus. This name was recently changed to the currently valid Pristis pectinata (Latham 1794) due to a gender issue with the original name. The genus name Pristis is derived from the Greek word “pristis” meaning saw. Synonyms that have also appeared in the literature include Pristis serra Bloch and Schneider 1801, Pristis granulosa Bloch and Schneider 1801, Pristis acutirostris Duméril 1865, Pristis leptodon Duméril 1865, Pristis megalodon Duméril 1865, Pristis occa Duméril 1865, Pristis woermanni Fischer 1884,Pristis evermanni Fischer 1884, and Pristis anandalei Chaudhuri 1908. Carlson, J., Wiley, T. & Smith, K. 2013. Pristis pectinata. The IUCN Red List of Threatened Species 2013: e.T18175A43398238. Faria, V. V., McDavitt, M. T., Charvet, P., Wiley, T. R., Simpfendorfer, C. A., Naylor, G. J.P. (2013). Species delineation and global population structure of Critically Endangered sawfishes (Pristidae), Zoological Journal of the Linnean Society, 167(1): 136–164. Norton, S.L., Wiley, T.R., Carlson, J.K., Frick, A.L., Paulakis, G.R., & Simpfendorfer, C.A. (2012). Designating Critical Habitat for Juvenile Endangered Smalltooth Sawfish in the United States. Marine and Coastal Fisheries, 4(1): 473-480. Poulakis G. R., Stevens, P. W., Timmers, A. A., Wiley, T. R., & Simpfendorfer, C. A. (2011). Abiotic affinities and spatiotemporal distribution of the endangered smalltooth sawfish, Pristis pectinata, in a south-western Florida nursery. Marine and Freshwater Research. Slaughter, B. H. & Springer, S. (1968). Replacement of rostral teeth in sawfishes and sawsharks. Copeia 1968:499–506. Snyder, D. B. & Burgess G. H. (2016). Sawfishes Family Pristidae. Marine Fishes of Florida 2016: 42-43. Wiley, T.R. & Simpfendorfer, C.A. (2010). 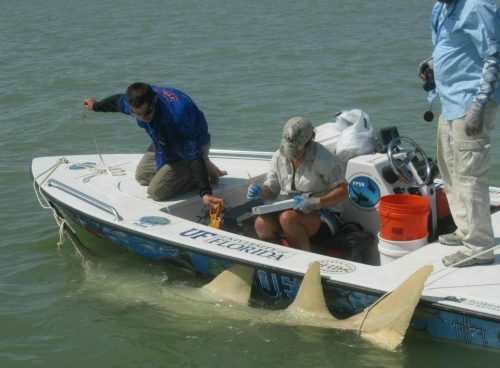 Using public encounter data to direct recovery efforts for the endangered smalltooth sawfish Pristis pectinata. Endangered Species Research 12:179-191.